The modular building known as B2, at 461 Dean Street, was supposed to cost less and be done much faster than a conventional high-rise. But problems in stacking the modules and keeping water out made for a slower, more expensive build-out. The Atlantic Yards apartment tower known as B2 officially launched in December 2012 with great fanfare and high hopes, and not just because of what developer Forest City Ratner proposed to build: 32 stories housing 363 apartments, half of them affordable. It was that B2, nearly flush to the Barclays Center, would be the world’s tallest modular tower, with its flooring, fixtures, appliances, and facades delivered within a metal-framed chassis some 10′ high, 15′ wide, and 30′ long. Forest City said it had “cracked a code” and claimed an “iPhone moment”. Two additional Atlantic Yards towers would start within the next 12 to 18 months, among the 6,430 apartments—2,250 of them below-market—planned for the project, all to be built modular. B2’s 930 mods—which Forest City CEO MaryAnne Gilmartin likened to “shrink-wrapped apartments—would be made at a new factory at the Brooklyn Navy Yard. The first mods arrived at Dean Street and Flatbush Avenue in December 2013 with a proud “Made in Brooklyn” wrapping. B2’s pioneering approach was seen as more than just an intriguing development at the highly contested Atlantic Yards site. Its designers and admirers thought the modular method might lower the cost of affordable housing, creating a new model for high-rise, union built apartments. Today, the reality of B2 has not matched the anticipation. The building—delayed, stalled, and since re-started to reach half its ultimate height—will take more than twice as long as promised and cost far more than projected. B2, also known as 461 Dean Street, remains mired in lawsuits filed by Forest City and its former partner Skanska, with dueling charges of incompetent execution and flawed design. While Forest City Chairman Bruce Ratner in July 2014 claimed on NY 1 that modular “worked out technically perfectly,” with delays the only problem, state documents acquired via a Freedom of Information Law (FOIL) request paint a more ominous picture. Half of the first 39 apartments suffered significant water damage. The first four floors were “largely gutted,” according to reports from consultant STV, which serves as owner’s representative for Empire State Development (ESD), the state agency overseeing/shepherding the entire Atlantic Yards project, which has been renamed Pacific Park Brooklyn. While many in the modular field hail Forest City’s boldness, some wonder if the project pushed too hard, given the challenge of what builders call “tolerance issues”—essentially cumulative slight deviations from a precise fit—as the 32-story building rises. Modular apartment construction has begun to emerge in New York City with more tempered ambitions, notably the completed seven-story Stack in Inwood and the emerging 11-story Carmel Place in Kips Bay, a city pilot program for micro apartments. While modular builders in the United States have focused on low-rise structures including retail facilities and hotels, those abroad have been more ambitious. The tallest modular building was long a 24-story dormitory built in 2010 in Wolverhampton, England, though this year a 57-story building was completed in Changsha, China. Forest City’s plan to leapfrog Wolverhampton drew kudos from public officials like Mayor Mike Bloomberg, and many in the planning, housing, and construction fields for charting a new way. “We think [modular] can be explosive for the business,” Forest City construction chief Bob Sanna told the trade publication Engineering News-Record before construction began. Forest City aimed to save 20 percent off conventional construction and cut 10 months from a 30-month schedule, thanks to concurrent work both on-site and in the factory. Beyond savings from speed, a new labor agreement meant cross-trained union workers would complete multiple tasks at lower wages in climate-controlled conditions. Building some 60 percent of B2 off-site would mean greater quality control, require fewer trucks, and produce less waste. Building “quickly, densely, affordably, and sustainably,” wrote Gilmartin in the Forum for Urban Design’s spring 2013 Next New York compilation, could help “radically shift how we build great cities.” Modular, Gilmartin said at the Municipal Art Society’s (MAS) October 2013 Summit for New York City, “will be truly revolutionary,” and would “significantly help” with affordable housing. In 2014, the MAS would award Ratner and Gilmartin its highest honor, the Jacqueline Kennedy Onassis Medal, for achievements including modular. Indeed, that quest faced complications. For nearly a year, STV’s William King had been reporting to Empire State Development about delays. Though the FC Skanska joint venture aimed to reduce construction time from one month per floor to one week, on Dec. 13, 2013, one day after the first modules were set in front of invited media, King noted that the initial floor had taken more than four months. In March 2014, three installed mods on the third floor were removed for repairs to gaskets, which seal the facade, thus delaying fourth-floor installation, King reported. Other mods would have to be reinstalled, as well. Though second-floor mods were said by FC Skanska to be finished, King’s walk-through at B2 revealed that many lacked appliances, sinks and toilets. Some had unfinished flooring and wall work. Also required was “on-site leak-damage repair/replacement of water-damaged ceilings, walls and floors, and possibly other elements such as electrical,” he wrote. On April 4, 2014, King reported that, after a very rainy weekend, “a rain barrel filled up” in one third-floor unit, and water entered second-floor mods. A revised schedule pushed back completion to May 2015, though King was doubtful. Indeed, on April 19, 2014, as evidence of the slow progress mounted, with just 122 modules installed, Forest City acknowledged to the New York Times that B2 was delayed until late 2015. By then, Forest City was pulling back on its modular ambitions. Its incoming partner on Atlantic Yards (excluding B2 and the arena), the Shanghai government-owned Greenland Group, had decided the next three towers would be built conventionally. That decision seemed a recognition of the delays at the factory because of the ongoing B2 project, and a red-hot Brooklyn market into which the joint venture was anxious to dive more deeply. It meant Forest City wouldn’t necessarily be able to build steadily on the lessons of B2. Forest City claimed to the Times that it had solved modular’s technical challenge but cited delays in setting up the factory, cross-training workers, and establishing supply lines. Internal reports from the owner’s representative suggested larger challenges. King that month reported on gut renovation of wall board from ceilings and walls on the second floor, as well as “significant water damage” in half the units. “Jury is still out on gaskets which may be under increasing stress under weight of additional floors,” he wrote April 8, 2014. Four months later, in the last of the documents delivered by FOIL, he had not reached a conclusion. Over the late spring and summer, more water damage emerged, as well as quality control issues, including torn gaskets, dents, and scratches to the exterior façade. One mod was such a tight fit, King reported in June, that a worker used a crowbar to try and move it. If such problems weren’t visible to passersby, others were glaring. As shown in July 12, 2014 video shot by this reporter, loose facade panels flapped loudly in the wind. Some modules didn’t line up precisely enough for the facades to fit, so panels had to be wired open, King wrote. But as problems mounted, bi-weekly construction updates provided by the developer and distributed by ESD made no mention of the building’s problems or the ad hoc repair work, which also included re-lifting installed units to ensure proper alignment. Nor did state officials—long navigating the potentially awkward role of both overseeing and shepherding the project—bring such problems to light. The internal construction reports provided via FOIL end in September 2014 – just after a simmering dispute between the modular partners finally became public. Skanska shuttered the modular plant and furloughed workers, having failed in its request for Forest City to pay more to cover the added costs of delays and construction problems. (Forest City says Skanska should abide by a fixed-price contract, while Skanska counters that the risk it assumed was based solely on a failure to follow Forest City’s intellectual property.) The two companies each claimed to have been blindsided, Skanska by Forest City’s decision to build the next towers conventionally and Forest City by Skanska’s closure of the factory. As later surfaced in the litigation, a 146-page letter from Skanska’s Richard Kennedy warned that, beyond the risk of leaks, the steel frames used in the project had limited adjustability, threatening misalignment. While a 2012 prototype had tested well, Kennedy contended that two-story model couldn’t capture the strains and stresses on a full, high-rise building. Forest City called such criticism baseless and blamed Skanska’s execution as general contractor. 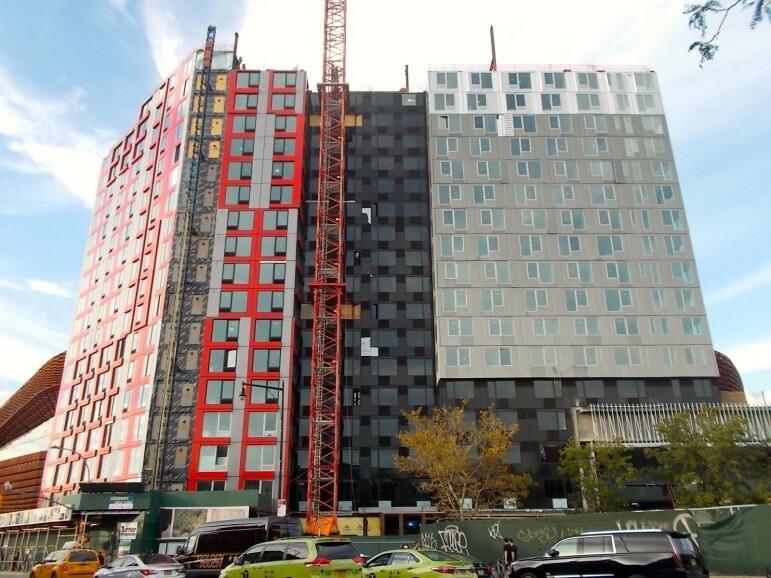 After an emerging modular builder, Julian Bowron of VectorPraxis, told WNYC last October that some modules of B2 seemed visibly misaligned, a Forest City spokesman said it was unprofessional to inspect an incomplete building. “It was self-evident there was a problem,” Bowron, a machinist by training, said recently. After being read King’s report of “significant water damage,” Smith (who has no direct experience with B2), said that’s “not very common” with modular. As the lawsuits percolated and cost overruns mounted, Forest City (having bought out Skanska) in early 2015 reopened the Navy Yard factory under its own management, determined to finish B2 and maintain its modular business, which cost $6 million in research and development, not to mention the cost of the factory. The tower, once expected to cost $155 million, could ultimately cost $265 million, Forest City told the Securities and Exchange Commission. It’s now scheduled to open by December 2016, a four-year buildout. Forest City last October bought out the interest of its 75 percent equity partner, the Arizona State Retirement System. Forest City, whose executives are close to Mayor de Blasio, still thinks modular can help solve affordable housing challenges. As Crain’s New York Business noted in March, the city has proposed zoning changes that would increase the height—but not square footage—limits on buildings, which would assist modular buildings, since the stacked units mean much thicker floors than in conventional buildings. It’s not clear that the troubles encountered by B2 reflect on the potential for high-rise modular in general, the specific technology used in the project, or the execution by the companies involved. Some in the field criticized Forest City for pushing modular beyond typical North American practice by commissioning modules with their facades attached in the factory, which shows a greater commitment to prefabrication but allows for less adjustability. Bowron praised Forest City for trying “the most progressive possible way,” following the lead of builders in Australia and Europe. The full set of documents is here. City Planning says it welcomes community-generated rezoning plans. But one such proposal—seven years in the making—is not getting much support. It’s a good thing we’re talking more about New York City’s homelessness problem—if the talk is aimed at addressing the crisis.